Last year, Apple introduced a ‘revolutionary’ new iPhone X as if it were a futuristic concept car—alongside the more typical, incremental advancements of iPhone 8. The new X was intended to show off Apple’s vision for the future of mobile devices. This year, that future arrived and expanded to become the new normal, fully exploiting Apple’s lead with the front-facing 3D TrueDepth camera. Over the past year, Apple’s big investment in front-facing depth sensing camera technology has paid off in record profitability. The components and technology Apple pieced together in a series of acquisitions resulted in the TrueDepth array of sensors and support for facial tracking and Augmented Reality in iOS. These were successfully packaged as key sellers of iPhone X. Rather than just being presented as potentially-usable new hardware the same way Google mused that its new Pixel 2 silicon would someday do some new magic stuff that it never actually did, Apple’s new iPhone X tech is used in computational photography featuring AR overlays of studio-like Portrait Selfie enhancements, facial tracking in Animoji and Memoji avatars as well as gaze detection, as well as Face ID secure biometrics for phone unlocking and approving app purchases and Apple Pay transactions. Buyers understood what they were laying down money for. It wasn’t credulity in a promise or a gamble on a new device like Andy Rubin’s Essential. The iPhone X legitimately offered features that could be demonstrated in an Apple Store and used immediately after buying one. And, a year later, it could be assumed that Apple would develop and release more new features in iOS 12, then more in iOS 13, because Apple supports its hardware for years —unlike Windows Phone, Android or any other mobile platform. Apple’s ability to take raw technologies (formerly picked up and experimented with by others, including Microsoft’s Kinect and Google’s Tango), find realistic, valuable and salable applications for them, and then build and develop these into shipping products at prices that large audiences rush to adopt—is wildly unappreciated. Rather than seeing value in Apple’s ability to turn hay into gold (as it has done with HDR, Siri, Touch ID, Beats and many other acquisitions), critics have compared Apple’s series of home runs to a movie studio at risk of releasing a flop film. 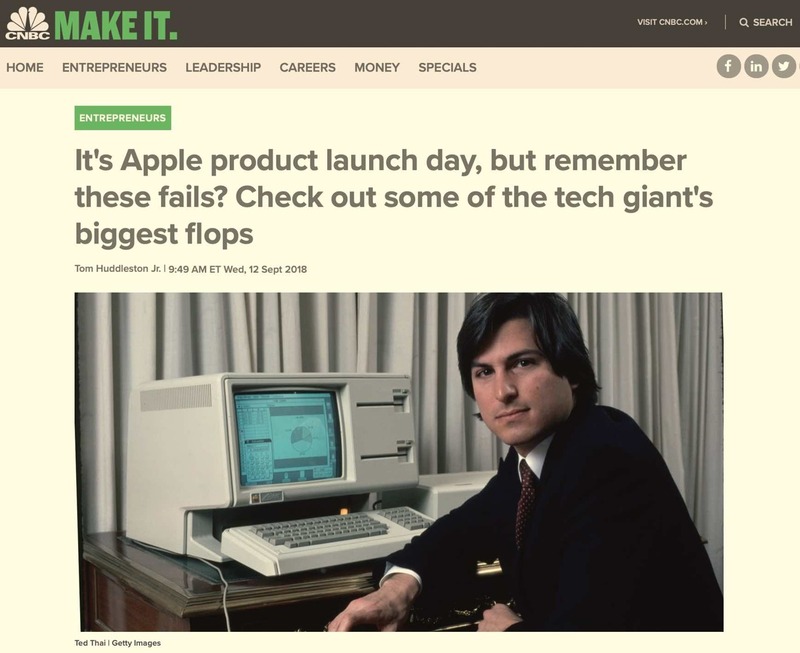 Just prior to Apple’s latest product introductions, CNBC republished its worn out rag-feature of “previous Apple flops,” for which it had to go back to the dawn of computing in 1980 for the Apple III, the 1983 Lisa, and the obscure Mac TV, a half-launched product from 24 years ago. When Google tries to imitate Apple’s launches for its Pixel-branded products, nobody can go back to its non-existent history in the 1980s to enumerate things that didn’t sell. But they don’t have to. Over the past decade, every Google Nexus and Pixel device has been a disaster that has had no discernible impact on the market. That includes last year’s Pixel 2, a mega flop that was fawned over by the media despite claiming little more than me-too features from the previous year’s iPhone, offered at a price that nobody in Android-land was going to be able to afford. Yet despite introducing a series of significant revolutionary advancements to how people use smartphones, Apple has been hounded for not being “revolutionary” in an industry that effectively does little more than scramble to copy Apple’s innovations. Android licensees seek to copy Apple so stridently. Their own novel ideas have not successfully sold, while Apple’s have. It’s therefore interesting to take a look at how Apple has rolled out new tech to see why it has been successful, in contrast to its rivals. Think, for example, of early Android fingerprint sensors, Android phones with 3D displays, Google Pay NFC, flawed face-image recognition, curved displays and a variety of other technologies that were either badly rolled out, poorly implemented or dubious to begin with. One way Apple has uniquely introduced new tech successfully involves its secrecy as a company. For iPhone X, Apple developed many of its technologies in total secrecy to the point of being finished in offering narrowly defined applications, rather than introducing a wide range of only partially finished capabilities with unclear value. There are a few different ways to introduce a major new shift in technology. Back in 1997 when Steve Jobs was working to modernize the Mac’s operating system using advanced NeXT software, Apple announced its plans for a future “Mac OS X” at a time when it was only offering MacOS 7.6. In between, it introduced two major updates of the status quo (branded as Mac OS 8 and 9) before launching its new product under the X branding—four long years later in 2001. It took several more years for Mac OS X to become the mainstream Mac experience. Mac OS X eventually became Apple’s most important platform, and paved the way for iOS. But its arduous deployment took a long time to arrive. Fortunately, Apple’s primary competitors were not ready. Today, Apple’s far greater resources have made it much more competitive in rolling out updates rapidly, as time-to-market has increasingly become more important. The tech world has similarly been asked to wait many years for updates from other companies. At the end of 2006, Microsoft finally shipped Windows Vista 6.0, which had been stuck in a vapor limbo for much longer—more than a half decade after Bill Gates initially outlined promises for advanced new “Longhorn” features (most of which never materialized) in 2001. Many years later, Microsoft was still struggling to get legacy Windows XP users to adopt Windows 6.x, which it incrementally released under the marketing brands Windows 7 and Windows 8. In 2015, Microsoft skipped over “Windows 9” to introduce Windows 10 (which it also internally incremented to the ‘Windows 10.0’ version), finally catching up to Apple numerically after fifteen years of being negatively compared against Apple’s Mac OS X. This year, Apple has also skipped an “iPhone 9” generation, but under different circumstances. Rather than just announcing plans for a future new “X” platform in iPhones, Apple did the work in advance in secret, then released it to the surprise of its audience last year at its first Event held at the new Steve Jobs theater at Apple Park. Calling the new iPhone X its “vision for the future of iPhone,” Apple’s chief executive Tim Cook detailed its new support for Face ID using a radical new 3D-sensing TrueDepth front facing camera system that also enabled face structure sensing, as well as an all-new hardware design featuring an edge-to-edge OLED design, with rounded corners and a notch never seen before in a commercial product. Many of its new features (including induction charging and its advanced A11 Bionic processor with Neural Net silicon, a new Apple GPU, and advanced memory controller) were also shared with the more conventional iPhone 8 line introduced at the same time. This suggested that Apple might continue to advance the two iPhone forks, introducing both a conventional iPhone 9 and a new iPhone 10+ this year. Instead, Apple doubled down on its iPhone X advances, creating a faster, enhanced “S” model and a larger “S Max” version. And rather than continuing the past, it locked older iPhones designs in place and introduced a new, entry level X model at a lower price using an LCD screen and an aluminum frame—at a price similar to iPhone 8. Rather than another pre-X model 9, Apple released iPhone XR. Incidentally, note that Apple didn’t ever release a 7S or 8S; by skipping the 9 (and 9S! ), Apple now has reached “X” faster than Samsung, which had been incrementing its Galaxy lineup version every year, rather than following Apple’s tick-tock cadence with in-between S models. 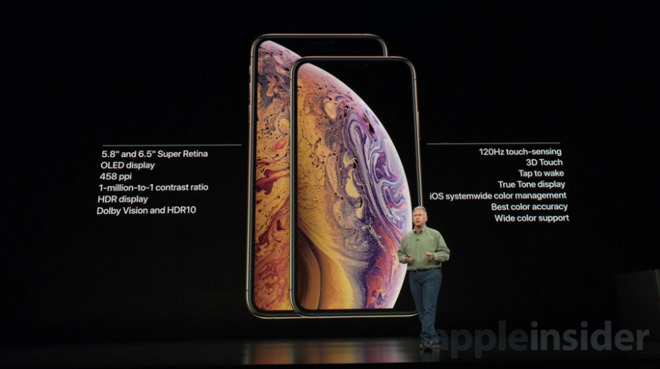 Note that Apple didn’t just reach X, it’s now sitting on a portfolio of X models: XR, XS and XS Max. This is just marketing, of course. New 2018 Touch ID is an iPhone Nein! A year ago, critics (essentially everyone) pounced on its $999 entry price, wondering aloud who would pay $1000 for a cell phone. Never mind that millions of people were already paying that much for more expensive versions of iPhone 7 Plus, or that iPhone wasn’t just a cell phone but also the primary personal computer for millions of people, as well as their primary camera and their personal entertainment system. Ten years ago, the $999 price of iPhone X would not have bought a state of the art camera, a pocketable computer, a personal audio player, portable TV and a cellular phone, let alone paid for any of the new key features of iPhone X. Add in inflation and last year’s iPhone X price tag would barely have bought the original iPhone and used iPod in 2007, or not quite an entry-level Mac in 2000. But, pundits were desperate to make up some new reason why Apple’s latest strategy was dangerously teetering on the brink of failure after spending so many years clownishly trotting out their old nag about how the company “couldn’t innovate” in an industry where the only remaining competitor was a range of Android clones that were all as exciting as eggshell grey, with an ASP plummeting faster than Android Tablets or Windows PCs. And even iPhone 8, which was both less expensive and performed virtually the same (making it very attractive to commercial fleet buyers in the enterprise who naturally were conservatively hesitant to rush out support for the brand-new Face ID on an expensive new model) couldn’t outsell iPhone X globally. Rather than being relegated into a niche “concept” tier alongside high-end Sony phones or other experimental or halo devices (including Apple’s own “Edition” Watch models), iPhone X remained the best selling smartphone throughout its entire first year on the market, establishing Apple’s ostensibly risky move as being incredibly gutsy and enormously profitable. After a wave of criticism and snark from competitors and their supporters, the entire Android ecosystem lined up to copy—at least superficially—the “notched” design of iPhone X, hoping that customers wouldn’t notice that their screens didn’t really fit into the corners, that their front facing camera didn’t really work similarly, and that their Android OS didn’t really handle memory well. 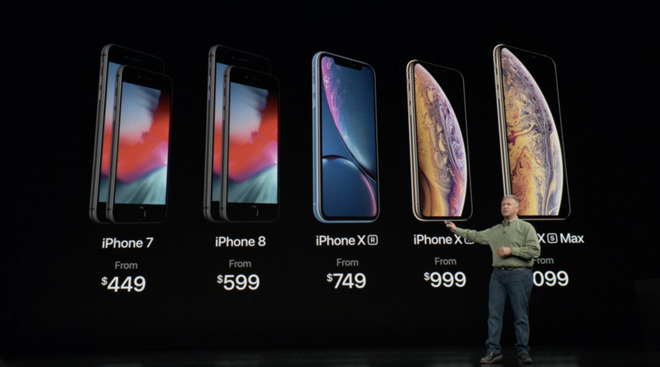 Apple now has a much wider array of iPhone X models, stretching across a much broader price range (from the XR’s $750 entry price to the most expensive XS Max model that looks to be priced at something like $1300 or more). There’s likely to be a lot of new interest in the colorful, cheaper iPhone XR, an iPhone X with a more approachable price tag. However, many of holdouts who waited to buy an iPhone X this last year were iPhone 6 through iPhone 8 Plus users interested in a larger display. They’re used to paying a premium for a big phone. That suggests that a significant amount of pent up demand will focus on the even-more-expensive XS Max, potentially lifting Apple’s overall ASP even higher, if not simply keeping it in check at its already incredibly high point, far above what any other cellphone maker can find demand at. Regardless of the specific product mix (which Apple will not reveal for competitive reasons), Apple is now in the position of using its most advanced iPhone X product group to both increase unit sales with a cheaper model that’s less expensive to build, and to tempt buyers upward into more expensive models (including the new Max and the new 512GB capacity tier, newly supported by the A12 Bionic storage controller). And for all of the analyst conjecture that suggested Apple was certain to have to backtrack to Touch ID and somehow fit a fingerprint sensor in its new X model, it’s clear that Apple’s original story was accurate and analysts were wrong. Apple’s iPhone roadmap is moving in one, solid direction, not advancing in parallel lines with an incremented “Classic” model lacking primary features of the future of the iPhone platform. That’s an even more aggressive shift to the future than what occured with previous shifts, such as how Lightning took years to replace the old Dock Connector across Apple’s product line, or how iPhone 5 was carried ahead in various colors but lacking Touch ID or the 64-bit A7 chip on iPhone 5c in 2012, or how the last major design revolution in iPhone 6 was accompanied by a more compact iPhone 5s and then the iPhone SE model for four years. Over the past year, specific, high-profile journalists at the Wall Street Journal, Nikkei, and Bloomberg composed multiple and parallel false stories that claimed that Apple’s new iPhone X didn’t offer enough new “innovations” to interest buyers and was far too expensive to sell in meaningful quantities —the total opposite of reality. They put their reputations on the line to rush out a story that might have been true, if their logic had been founded in reality rather than just invented conjecture. These weren’t simply analysts spewing out made-up ideas hoping that some of their thoughts would end up looking intelligent after the fact. These were reporters who falsely portrayed their writing as factual, professional journalism—reporting, not invention. To the surprise of many, they were totally wrong, as iPhone X left the gate outselling Apple’s other, more affordable models (including the similarly fast and wirelessly-functional iPhone 8 and the much cheaper, year old iPhone 7, as well as the cheapest-ever iPhone SE). However, after the initial holiday quarter, writers at those papers continued printing stories that suggested they’d done some research or observation into iPhone X sales and found problems with ongoing demand. They also created reports suggesting evidence that Apple was slashing production of iPhone X, creating waves they claimed to have observed among Apple’s suppliers. But, those reports were false. And they were repeated anyway. They were not accidents or mistakes. They were false, and they appeared malicious, not mistaken. Rather than reporting what was actually happening based on facts and research, these establishments were simply concocting tales of what they hoped —or perhaps guessed —might happen based on nonsense and whispers. None of these people acknowledged these false reports. The reporting of the Wall Street Journal, Nikkei, and Bloomberg can no longer be trusted to be accurate, impartial and honest, particularly when they attack Apple and report on what they imply are facts ascertained from Apple’s supply chain. They could not have been more wrong, and have still not explained why they published garbage-whimsy as factual data sourced from people supposedly “familiar” with what was actually happening. If these writers held any other job and made a mistake of this magnitude, over and over, they would have been fired as incompetent. They kept forwarding a story quarter after quarter as it was proven wrong publicly over and over, maintaining all the while that they had some special insight or access into the industry they they clearly didn’t have at all. This year, as Apple gears up to unleash its second generation of iPhone X models, the hyper-scrutiny of its unit mix and the contrived supply chain mumbo-jumbo of analysts and these disgraced journalists should have even less impact on the perception of Apple’s business.